Students pause for a moment of reflection during a candlelight vigil Friday evening for victims of the Sewol ferry disaster. The event was organized by several student groups, including the Korean American Students Association. 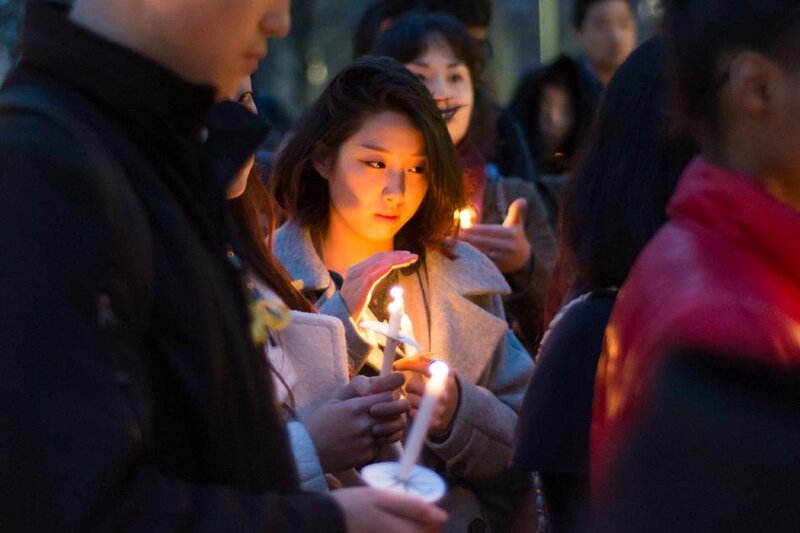 Members of the Northwestern community gathered Friday night under the soft glow of a candlelight vigil to commemorate the lives lost in last month’s South Korean Sewol ferry sinking. About 50 students, alumni and faculty members attended the vigil, which was organized by NU’s Korean American Student Association, Koreans At Northwestern University and Asian Pacific American Coalition. Standing around The Rock, the crowd remembered the tragedy, which occurred on April 16, when a Sewol ferry capsized with 476 people on board. Most of the people on the ship were high school students, and at least 236 individuals died and 66 are still missing. As the vigil began, the glow of a sea of white candles gradually radiated from the area as people passed the flame from one wick to another. The vigil started by taking a moment of silence to reflect on those affected. Individuals then wrote messages on a banner while a student initiated the singing of the Korean national anthem. The event concluded with people taking turns sharing their initial reactions and feelings about the tragedy. Many members of the crowd were in tears throughout the vigil. During the vigil, attendees wore yellow ribbons around their wrists or pinned to their clothes. Korean families affected by the tragedies had used yellow ribbons as a sign of hope that their children would come home and to commemorate their loss and innocence. Members of the crowd also held fliers passed out prior to the event that read, in Korean, “stay where you are.” These words were the instructions the crew leadership repeated over the P.A. system as the ferry sank. The flier invited people to understand the political outrage some held about the event. Medill sophomore Hyo Jin Park organized and led the event as KASA’s president. With most of her family living in Korea, she felt there should be an event to represent the Korean community at NU.